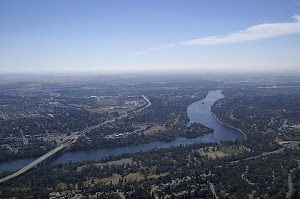 The American River runs from the Sierra Nevada to the San Joaquin Valley, eventually emptying into San Francisco Bay and the Pacific Ocean. History The Maidu peoples inhabited the American River for thousands of years before foreigners settled the region. They utilized the vast river resources for shelter, clothes, baskets, and other goods. 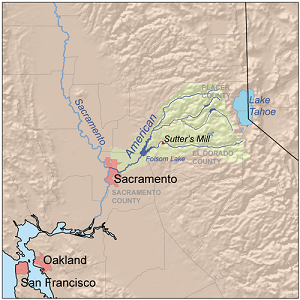 The California Gold Rush started in 1848 when gold was found on the American River. The South Fork in particular was a top destinations for early miners. River Forks the American River is divided into the North, Middle, and South forks; the three forks originate in the Lake Tahoe area. All three forks are known for their verdant canyons, forested ridges, massive rock formations, trails, winter adventures, snowy peaks, fishing and white water rafting. 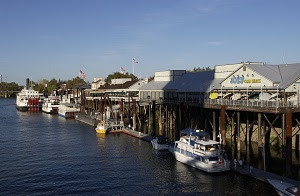 Fish species that live within the American River include the Chinook salmon and Steelhead Trout. American River Parkway below Folsom Lake, the river passes through an urban area and riparian park containing fishing and family-oriented rafting, paved bicycling and multi-use trails. Also, Leidesdorff Ranch, a 35 thousand acre - 140 km2 - cattle and wheat agribusiness. 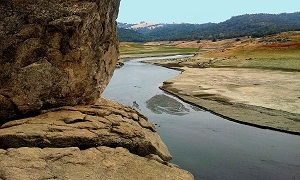 Ecosystem the climate of the California American River is Mediterranean; rainy winters and very dry summers. The region is prone to seasonal drought conditions. 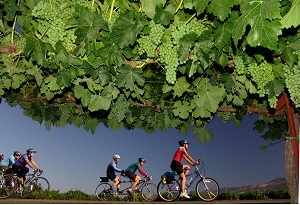 Sacramento County is known for its cool winters, and hot summers, with low average precipitation. Much of the Central Valley was historically wetlands, which made the ground very fertile and attractive for agriculture. The American provides Sacramento County with its main source of drinking water and houses a multitude of plants and wildlife, creating an immensely bio diverse ecosystem. 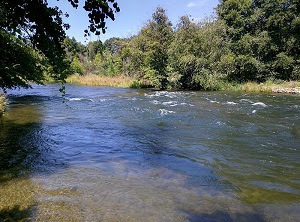 The American River Conservancy works to conserve the wildlife, aquatic and terrestrial habitats and resources around the American River watershed. The land they protect helps the American River water quality by conserving and resorting wet meadows, wetlands, and riparian areas. It also preserves the cultural and historic values of the river systems and surrounding landscapes. Recreation whitewater rafting; the South Fork has Class III rapids, the Middle Fork has Class IV rapids, and the North Fork has Class IV spring run-off rapids. All three rivers also feature Class II sections. 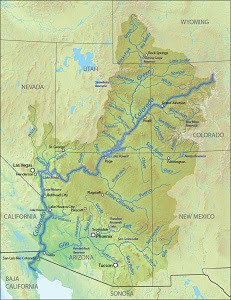 The Colorado River flows from the Rocky Mountains through the Grand Canyon to the Gulf of California between Baja and Sonora in a southwestern direction for 1,450 miles - 2,330 km; it drains an expansive, arid watershed that encompasses parts of seven U.S. and two Mexican states. With dramatic canyons and whitewater rapids, the Colorado is a vital source of water for agricultural and urban areas. The river and its tributaries are controlled by an extensive system of dams, reservoirs, and aqueducts, which in most years divert its entire flow to furnish irrigation and municipal water supply for almost 40 million people both inside and outside the watershed. Its large flow generates hydroelectric power. Native Americans have inhabited the Colorado River basin for at least 8,000 years. Between 2,000 and 1,000 years ago, it fostered large agricultural civilizations which collapsed from severe drought and poor land use practices. 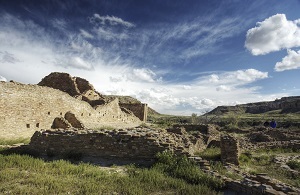 Europeans first entered the Colorado Basin in the 16th century. 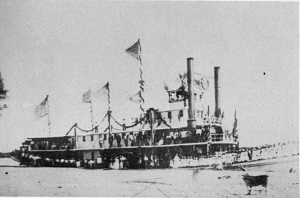 Large-scale settlement of the lower basin began latter 19th century, with steamboat landings along the Colorado River that linked to horse drawn wagons. Gold strikes took place in the 1860s and 1870s. Development of the river basin began in the 20th century with guidelines established in a series of domestic and international treaties known as the Law of the River with hydraulic engineering projects. 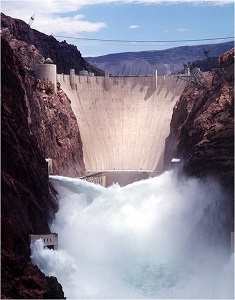 Most of the major dams were built between 1910 and 1970; Hoover Dam was completed in 1935. 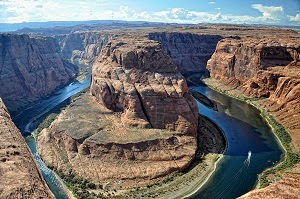 The Upper River is a swift whitewater stream ranging from 200 to 500 feet - 60 to 150 m - wide, and depths ranging from 6 to 30 feet = 2 to 9 m. The Colorado Plateau is a vast desert centered at the Four Corners of the southwestern United States. 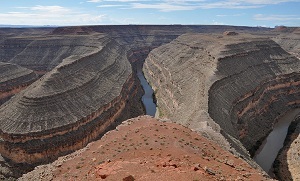 In Utah the Colorado is characterized by narrow canyons and unique folds created by the tilting of sedimentary rock layers along faults. Here, the San Juan River joins the Colorado from the east. The Colorado then enters northern Arizona where Glen Canyon forms Lake Powell. Lee’s Ferry was an important crossing for early explorers and settlers and since the early 20th century the principal point where Colorado River flows are measured for apportionment to the seven U.S. and two Mexican states in the basin. Lake Mead is the largest reservoir in the continental United States, formed by Hoover Dam and southeast of Las Vegas. The Lower Colorado River Valley LCRV is a desert region dependent on irrigation, agriculture and tourism and is also home to Indian Reservations. Tributaries The Colorado is joined by over 25 significant tributaries, of which the Green River is the largest by both length and discharge. The Gila River is the second longest and drains a greater area than the Green. Both the Gunnison and San Juan rivers, which derive most of their water from Rocky Mountains snow melt, contribute more water. 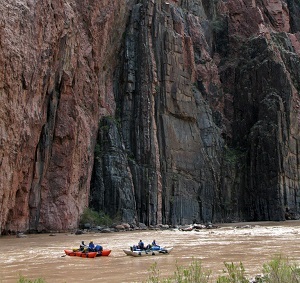 Recreation the Colorado is one of the most desirable whitewater rivers in the United States. Grand Canyon trips typically range from one to eighteen days for commercial trips and from two to twenty-five days for private trips. Several other sections of the river and its tributaries are popular whitewater runs, and many of these are also served by commercial outfitters. Eleven U.S. national parks are in the watershed, in addition to many national forests, state parks and recreation areas. Hiking, backpacking, camping, skiing, house boating, water-skiing and fishing are among the recreation opportunities offered in these areas.